The Dove Wooden Lean-to Greenhouse is the largest lean to greenhouse in the Dove line. This is just huge offering you over 20 feet of room so you have plenty of space to walk around and tend to your plants and food. The greenhouse comes with some staging, a lot of staging actually as it covers the whole length of the structure. At its highest point, you have over 9 feet of headroom so this would be great for growing really tall plants or for just having some high shelving. The roof also have four automatic vents so you can let in a good flow of fresh air if needed. The space this provides means that you can have the dream greenhouse of your dreams and grow those plants and food you have always dreamed of. As well as being breathtakingly gorgeous, this is also one of the most high quality lean to greenhouses you will ever see, the wood is not just standard wood, but Thermowood which makes it extra robust and resistant to the elements. The windows are all made from toughened glass which is not just strong, but also perfect for keeping in the warmth even on colder days. From the bottom all the way to the 9 foot high top this is one very high quality greenhouse. We know that some of you may have looked at the price of the Dove Wooden Lean-to Greenhouse, freaked out and closed this page. But for those who have stuck with us, well done. 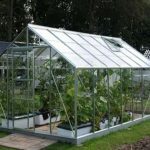 You are about to see why this lean to greenhouse is one of the most impressive we have ever seen. To start with this thing is huge. 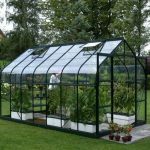 The Dove range of lean to greenhouses is something we really like and this one here is the biggest. Actually it is one of the largest lean to greenhouses we have seen from any manufacturer. It is 20 feet 10 inches long and that is not a typo we meant to write 20 feet! It is 6 feet inches deep which means that as most of the size is in its length, even smaller gardens may be able to enjoy this huge greenhouse. Its massive size means you can have lots of plants and food as well as tools and other equipment in here. Height wise it is just as impressive. The ridge is 9 feet 6 inches so even if you are a honorary member of the Harlem Globetrotters there is still plenty of headroom for you in here. At the lowest point it is 5 feet 8 inches which is quite a drop, but this is still inline with what most other lean to greenhouses offer at the eaves. If you look at the pictures you can see some staging. This runs all the way down the middle of the greenhouse so you have lots and lots of space to place plants, food or just to have as a workspace. The fact you get all this staging included with the price is something that really impressed us. The roof is made with toughened glass panels and some thick framing. So the roof is very strong and it is also going to be able to let in plenty of light. One of the things we really like about this roof is the way the slant is so steep. It of course gives the whole lean to greenhouse a very interesting look, but it will also make the run just run right off it. The roof also have four automatic opening vents which will let in a good flow of air if things get a little too hot inside. The whole roof including the vents have been sealed with this very high quality timber capping so leaks will never be an issue. The Dove Wooden Lean-to Greenhouse has some very smart looking tongue and groove cladding that is very thick and robust. But the wood the cladding is made from really is impressive. You see rather than just use standard timber, the wood that has been used here is Thermowood which is a technology that uses steam and heat to make the wood extra strong and long lasting. This is just fantastic and something that very few greenhouses, sheds & summerhouses use. But we can see this being a big deal in the coming years. If you take a close look at the pictures you can see just how thick and solid the framing in between all the glass is. Not just on the sides, but the roof as well. This makes for one very robust greenhouse that is going to stay strong for many years. While they do not say what the exact dimensions of this frame are, here at WhatShed, we can tell that it is thick and strong enough, that it is going to ensure the structure gives you many years of use. As this is a lean to greenhouse, you do not get a floor with it. You will need to install it on an area that has a concrete or another kind of solid surface. 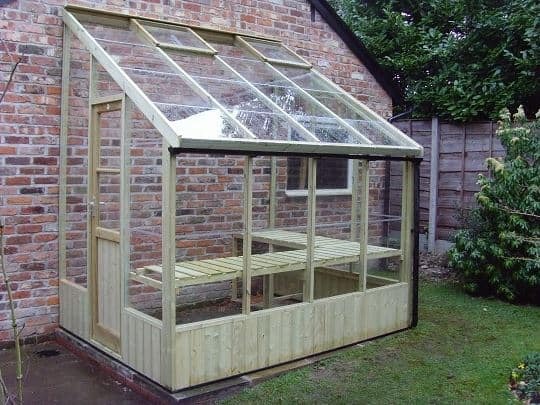 The Dove Wooden Lean-to Greenhouse has that amazing Thermowood process that we talked about, but we still would give it a coating of wood treatment once a year to ensure that there is never any chance of rot or decay spoiling your greenhouse. So far pretty much everything about this lean to greenhouse has impressed us. But we have looked, looked again, had a cup of tea then looked again and still we cannot see what warranty is being offered with this! Why they would not tell you upfront what the warranty is or if the warranty is dependent on you treating the wood is beyond us. 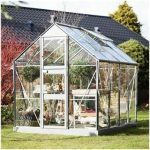 But in our experience most greenhouses like this tend to come with a five to ten year warranty which will cover you against rot as long as you regularly treat the wood. Be sure to inquire about the warranty before you order. The door that they have used is very smart. It actually looks more like a door you would find on a house than a greenhouse. It is a single door which stands at 6 feet 6 inches high and 1 foot 10 inches wide. The door has a very modern and high quality looking silver door handle as well as two good sized windows on it. Toughened glass is what all of the windows are made from and this just helps the overall high quality look and feel of the Dove Wooden Lean-to Greenhouse. This type of glass is going to do wonders at making sure the sun beams in and gives the food and plants you are trying to grow all they need. This is a high end greenhouse so using glass of this high quality was certainly the right way to go. We already said how much we liked the door from a design point of view, but it also gives the greenhouse some security. This is not just a flimsy sliding door. It has a proper lock on it so you can keep all your amazing plants and food safely locked away when you are not home. The lock is quite high so even if there is a squirrel with good lock picking skills, we doubt he could get up to unlock the door anyway. There is pretty much zero privacy offered with this greenhouse, but that is not something we are going to hold against it. It has huge windows and its presence makes it something that draws people’s eyes to it so privacy is not something you get with this at all. A painting service is offered if you do not like that classic wood colour. Olive, Bracken, Earth and Lilly are the colours you can have the wood. The cost of each of this is a very expensive £993. We honestly cannot think of another garden building let alone a greenhouse that charges as much as this for painting the wood. 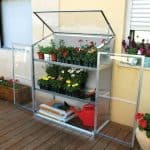 The Dove Wooden Lean-to Greenhouse does have a few extras for you to consider. We feel the staging that comes with it is more than enough, buy if you want more then you can add it for £383. If you want to take advantage of the highest this offers then they also have some high shelving which costs a rather pricy if you ask us, £193. You can also add some guttering for £143 which might be worth thinking about if you do not like the idea of rain running down the front of your greenhouse. We really are blown away with this lean to greenhouse. 10/10 may seem high to some of you, but honestly we cannot find one thing about this that is low quality or where they have cut corners. It is just high quality top to bottom. The Thermowood, toughened glass and solid frame will ensure you get decades of use out of this. Just be sure to look after that wood with a coating of treatment and you will never have an issue. As one of the largest lean to greenhouses we have ever seen. You have all the space you could need in here. Not just on the floor, but the headroom is also impressive. The price you see does include an installation service so just put your feet up and let them do it. Or take the time to let the kids know there is an invisible 2 foot barrier round the greenhouse which if they cross means trouble! 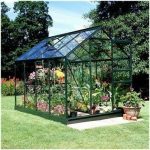 Over three thousand pounds for a greenhouse is not cheap and it certainly puts this out of reach for most of us, but if you want the very best then this is that and you are going to have to pay for it. Final Thoughts: The Dove Wooden Lean-to Greenhouse is just incredible. We are not exaggerating when we say that from the bottom all the way to the top, this is high quality. 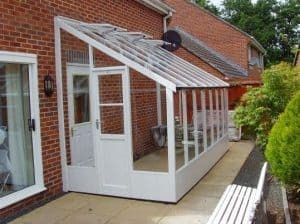 They have done just an amazing job with this lean to greenhouse. The Thermowood, the toughened glass windows and the frame keeping it all together are just top of the line. Add to this the doors, the way everything is sealed and the vents and you can see why it is priced so high. This is very, very expensive, but at the same time it is made to the highest standards and does include installation. 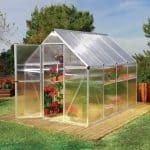 If you want the best lean to greenhouse that is on the market then this one right here might very well be it.